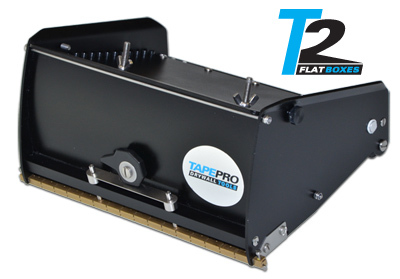 Introducing the new T2 Flat Boxes by Tapepro. The T2 boxes feature an alternate method of construction and provide an economical option for plasterers. The T2 boxes are assembled with fasteners and tie rods and feature a floating brass blade holder with an integral rubber seal. The CNC machined brass blade holder provides controllable flexing of the hardened steel blade to provide an accurate coat form and thickness. A simple cam wheel is provided for adjusting blade tension and allows easy and accurate setting for the perfect crown.